In 1191, Glastonbury’s monks announced that they had found the grave of King Arthur and Queen Guinevere. 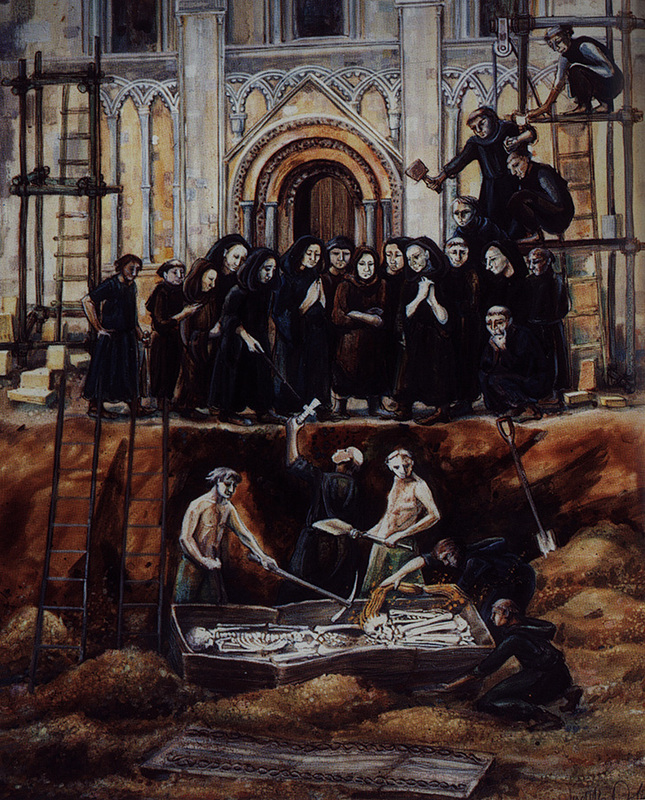 Gerald of Wales gives the earliest account of the excavation, writing in 1193. The monks found an inscribed lead cross in a grave with the bodies of a tall man and a woman. The cross was inscribed “Here lies buried the renowned King Arthur, with Guinevere his second wife, in the Isle of Avalon”, apparently providing the first evidence that Glastonbury was the Isle of Avalon. 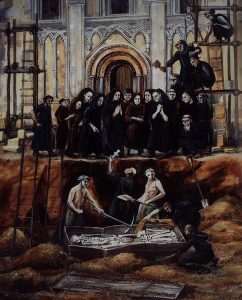 Following the exhumation, the bones were moved first to a chapel in the south aisle of the church, and later to a black marble mausoleum in front of the high altar. To see a reconstruction of Arthur’s tomb and to find out how archaeology has added to our understanding of Arthur at Glastonbury, visit Digital: Arthur’s Tomb (c.1331). For information about how the team reconstructed Arthur’s tomb, visit our page Reconstructing King Arthur’s tomb: the stuff of legends. For discussion of the Arthur story and its interpretation by historians and archaeologists, see pp 60–62 of the Glastonbury Abbey: archaeological investigations 1904-79 monograph.